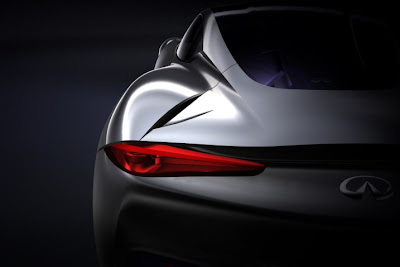 Nissan’s luxury arm has released a teaser image of the sports car concept they plan on showing off at the Geneva Motor Show in March, and now we know it’s not just going to be a rebodied hybrid GT-R or a fresh coat of paint on the Essence concept they kept dragging around the world. Because now we know Infiniti’s new electric sports car will be mid-engined. Explaining the strategy behind the concept, Andy Palmer, Executive Vice President, Nissan Motor Co., Ltd and Infiniti said: "At the Geneva Show next year, we will present our vision for a totally new kind of inspired premium performance car. Infiniti already has hybrid and clean diesel models on sale. And with an all-electric sedan on the way, the natural next step was to push the boundaries where performance and the environment intersect."